Welcoming Guests from all around the world since 1952! LaFontaine Center offers a beautiful ballroom that is available for interested parties to rent. Our ballroom is perfect for anniversaries, weddings, reunions, and holiday parties. For more information about rental costs and our fee schedule, please click here. We are proud to offer discounts to non-profit organizations who wish to host their meetings or gatherings in The Red Brick Room. For more information about rental costs please click here. Thank you for choosing our beautiful and historic Grand Ballroom for your special occasion. The Ballroom is part of the LaFontaine Center, a housing facility for seniors and the mobility impaired. Click here to view our ballroom regulations. 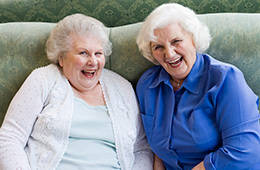 LaFontaine Center is part of Retirement Housing Foundation, a national, non-profit organization.